When it comes to YA reads, we open the door to a great collection of possible new favorite books. YA is a great distraction, a quick and sweet read about a teenage love story. But YA also means we find out which family troubles our main character has to deal with. YA further means that it might open a door in your mind, in your heart and will make you cry. It will make you cry because you suddenly become so invested into the story you picked up out of a mood and you can’t bear the fact that the story will be over in a heartbeat because you can’t put it down. And you also know, these few pages will be so intense and will make you feel SO many different emotions all at ones. Talking about all the different feelings YA books are masters to capture, mental health and the process to get on with our daily lives after a great loss are themes, which come up every now and again. But let’s be fair: not all writers are able to put a story, with topics as delicate as they are, to paper in a way so you still like to storyline for what it is. In When We Collided by Emery Lord, we have Jonah and Vivi. 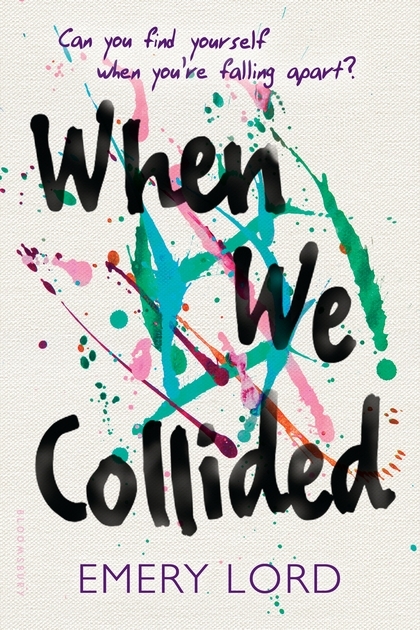 When We Collided cover courtesy of Bloomsbury. Jonah lived in Verona Cove his whole life and add to that, he’s one of six kids, which is just known by everyone, as their parents own a restaurant! But things have changed, as they all knew them as life was good, they also know them now as life turned to the dark side. Jonah has to face the first few months with his mother, with his siblings and with the fact that his father has passed away. And then, there is Vivi! She is such a bubbly character! She changed her hair colour right before he started this summer job-thing in Verona Cove, she makes friends along the way, suddenly got a routine to have breakfast with the police chief of the village every morning and then…She likes to throw the medicine she should take in the ocean. Jonah and Vivi weren’t supposed to meet, but as they did, both their lives changed for the better. They met, their lives literally collide, they fell in love and they made each other face their own inner demons, in a way no one else could do. We find out how Vivi helps Jonah to continue in his father’s restaurant, how they make it work to continue being surrounded by all the people he loves so much and being able to remember his father, but also continue with his own life. Vivi’s mental up’s and down’s lead to the fight between Jonah and herself. The mental state she’s in, isn’t as stable as she though in the first place, but all she cares about is her love for Jonah, the moments they spend together and this sweet, precious summer love of them. But then, there’s the night, which changes her mind, the moment, her sense for reality hits back in and she knows, the next step is one, she has to take all for herself. But no one she met in the time frame of this summer will ever forget that Vivi was here. When We Colided is is one of the most beautiful, cute and funny stories you will ever pick up. At the same time, it is a shout out to every single one of us which have to face a battle because of a loss we experienced or the up’s and down’s there are when you have to deal with mental health issues. Yes, live your life to the fullest, be happy, be brave and show who you really are. But never forget the most important thing to care about, is your mental health. Even you might think, there is no one to talk about it, there is always help. Which YA book and theme is your favourite? Head over to Twitter and send us your recommendations.